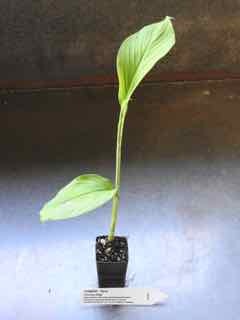 Turmeric plant, Curcuma longa, is one of the ancient spices of Asia. The root is an essential ingredient of curry and primarily responsible for the yellow colour. The fresh leaf is used as a wrap to flavour food in cooking. Current folk use of the root as a remedy for adult diabetics, carpel tunnel syndrome, heart problems and immune system support. The powdered root produces a gold-yellow dye. Turmeric plant is native to India and Asia preferring rich, moist soils in a protected, heavily shaded position. Drought and frost tender. A perennial plant, growing to 0.5m x 0.5m. Be the first to review “Turmeric, plant” Click here to cancel reply.